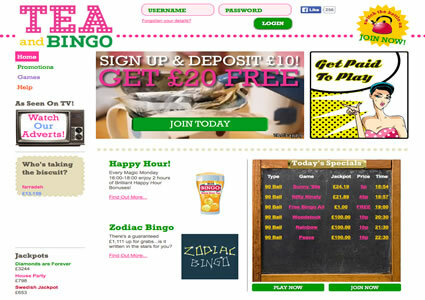 Tea and Bingo moved to the Dragonfish Network in July 2013, if you were a previous player with this brand, you will need to re-register on their new site. Bonus codes were sent to all of the existing members of the Tea and Bingo brand before the change in software as a little sweetener. First impressions after viewing their latest homepage brings the word ‘bland’ to mind and it seems that once again an online brand has fallen into the Dragonfish trap of networked promotions and similar games – just another bingo site added to their rather large collection and sporting a different skin. Registration is pretty standard to Tea and Bingo, you will have to fill in all the mandatory fields such as name, birth date, email, address, username, password, etc and there is also the option of filling in your financial details (which you do not have to fill in) but if there’s a ‘no deposit welcome bonus’ in play you will have to enter your payment details to be eligible for that bonus. Plus there will be further bonuses to take advantage of when you come to make your first deposit and for every deposit you make from then on – those are called reload bonuses. Please note that you should always check what their latest welcome offers are, as they are subject to change. You’ll find three different styles of bingo played here and those are 90 ball, 75 ball and High 5 Bingo. A series of progressive and coverall jackpot games will be played throughout all three of the above variants, even High 5 have got their own progressive jackpot running – called the Swedish Jackpot. Call bingo in 50 calls or less and the prize pot will be yours; either way the winner will be guaranteed £150. As much as their welcome offers, promotions are subject to change too but you will find some firm favourites amongst the bunch. Happy Hour is one of those specials and has been available on the Dragonfish Network for quite some time now, but that could have something to do with the fact that this particular promo offers not one, not two, but three kinds of benefits. With all of this on offer, no wonder Dragonfish have kept this as a fixed promotion. Not forgetting their ‘Refer a Friend’ feature has been available since the dawn of time and you could find yourself £10 richer, simply for referring your friends. 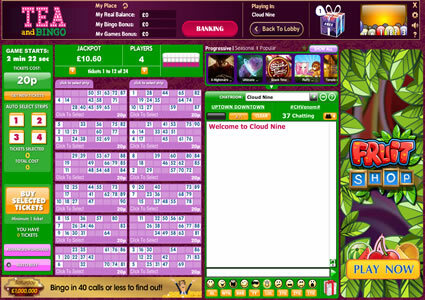 There’s plenty going on in the Bingo Lobby at Tea and Bingo, you’ll find a vast selection of tabs to the left-hand side of the screen and each will point you in a different direction, such as ‘Daily Jackpots’, ‘Free Bingo’, ’90 ball bingo’, ‘Instant Games’, ‘VIP rewards’, and more. If you like a game of slots, then you’ll be happy to hear that TAB offer embedded slots games which means you can play slots and bingo at exactly the same time just in different windows. For a more personal play, you have also got the option to customise your game-play. Simply click the ‘Options’ tab (found underneath ‘Your Status’ in the bingo lobby) and you can choose whether to auto-daub or manually daub your tickets, have your best card shown first, show 3TG, alert when players join and leave, plus much, much more. 90 ball, 75 ball and High 5 Bingo are all offered here at this online bingo site and you’ve got up to ten rooms to choose from; there’s an array of daily guaranteed jackpots available with tickets priced at 10p. Look out for ‘Flower Power’, ‘Woodstock’, ‘Rainbow’, ‘Peace’ and ‘Free Love’ – each of these games offer a £100 guaranteed jackpot. Diamonds are Forever – 75 ball jackpot played daily in the Chatterbox room between the hours of 6:15pm and 11:45pm, these will be played every 15 minutes. Call bingo in 34 calls or less and the prize pot will be yours. This progressive starts at £500 minimum. House Party – this jackpot is played across all 90 ball rooms and on a 24/7 basis. Call bingo in 40 calls or less to be the winner of the current prize. This progressive starts at £100 minimum. 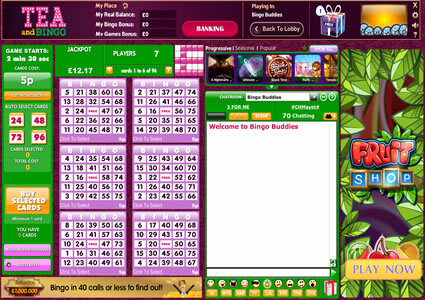 Swedish Jackpot – played 24/7 in the High 5 Bingo room and the prize pot start at £150 minimum. Call bingo in 50 calls or less to be the winning player. If you’re a Dragonfish regular then you will find all the standard networked promotions available, not that they aren’t fun to get involved with, it’s just when there are so many other brands out there in the online bingo industry, offering all the same then the question is – why choose Tea and Bingo? Well other than their enhanced welcome bonus, they pretty much offer the same as all other DF Sites. But on this network as a whole you will find that their CMs create a friendly community and you will be playing against players from other connected brands which always means bigger jackpots up for grabs. Take their ‘Million Madness Coverall Jackpot’ game – yes £1 million is up for grabs, but you will have to call bingo within 25 and 40 calls to be the winner of this life-changing prize amount. This special takes place three nights a week; Wednesday, Friday and Saturday; all tickets can be pre-purchased in the Pre-Buy room. Bingo is always great but sometimes you may want to drivel in something a little different such as those much-loved Instant Win games. 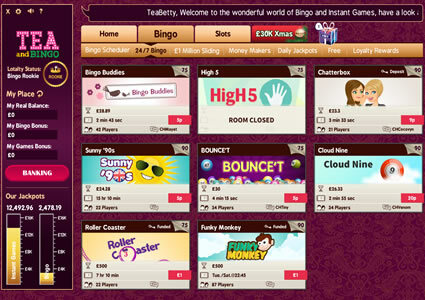 You will find a huge selection of slots, casino, scratchcards and featured games alike whilst playing at the online Tea and Bingo brand; just head over to the bingo lobby or check out the segment available under the ‘Games’ tab as you might find more information there.